Not long ago, I was contacted by Mark from Texas. 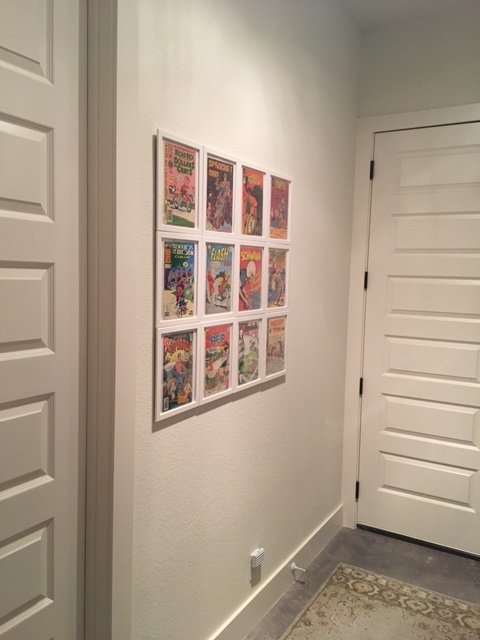 Mark wrote to tell me about how he used my IKEA Comic Book Photo Frame Hack in his new modern farmhouse style home. I am not a comic book collector but do enjoy the genre and all the new super hero movies that have come out. I have been an avid cyclist most my life and got an idea from reading an article called When Comic Books and Cycling Collide . My idea was to combine my love of cycling and the art of comics and display them on a wall in my new house. So, I started searching the internet for how I could do this? There are so many options and all would look good but I did not want to spend more money on the frames then I did on the comics I had collected. Then I came across Youseph’s post about Ikea Comic Book Photo Frame Hack and knew this was the way to go. Affordable enough with all the supply’s and will look great so my wife would be happy! I pretty much did it exactly as Youseph’s suggests in his post. I did change a few things to better reflect my needs. The new house style I had built was a modern farmhouse so all the walls inside the house are bright white. I did not want to go with black frames since I thought it would take away from the cover art so I went with white frames and white cardstock paper so the colors would jump out of the frames. I also did not want the frames to be flat on the wall so I did not cut off the diagonal stand piece. What I did was attach Command™ Medium Picture Hanging Strips to the middle of the frame on top of the diagonal stand piece and attached to the wall. This gave it the look that it is slightly floating off the wall. The other effect I was looking for was that this was one large piece of art so I butted all the frames up to each other. As you can see from the pictures I believe I have successfully achieved my ultimate goal. Since bicycles in cover art is few and far between I had to go with what I could find but my variety is not too bad. 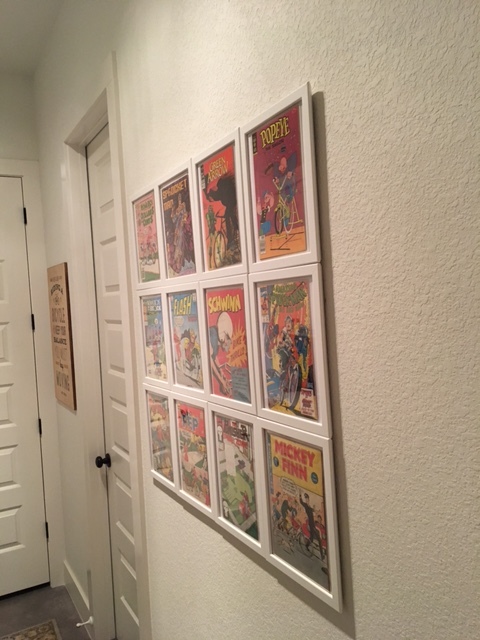 There were a few old DC comics that I would of liked to of bought but they were out of my budget, but since these look so great I may have to save up and do this again on another wall! 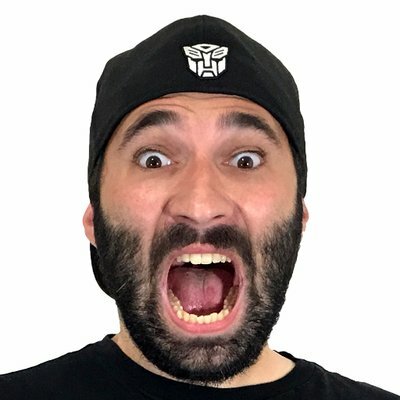 Thanks again Youseph for putting this out in the world for other to see! Thank you, Mark, for taking the time to reach out to me and allowing me to share your story. Your new house looks amazing! 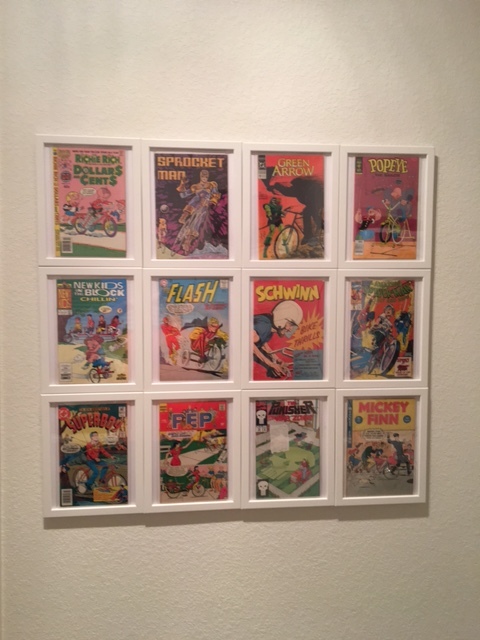 Has anyone else tried my IKEA Comic Book Photo Frame Hack? Drop me a line and share your story with me. I would love to hear about it.